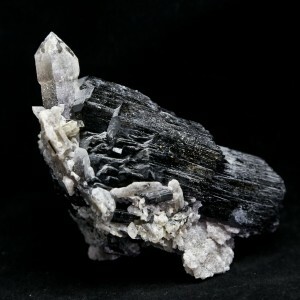 Jet-black schorl is the most common member of the tourmaline-mineral group. It crystallizes in the hexagonal (trigonal) system as long, longitudinally-striated prisms. Its black color is caused by a high iron content. 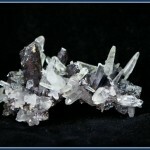 The mother of the quartz family which is comprised of silicon dioxide which is the second most abundant mineral in the Earth’s continental crust. Its a transparent rock crystal which holds all the color rays of the rainbow. MINERALOGY, PROPERTIES, OCCURRENCE: Schorl [basic sodium iron aluminum borosilicate, NaFe3Al6(BO3)3Si6O18(OH)4] crystallizes in the hexagonal (trigonal) system as long, longitudinally striated, jet-black, opaque prisms with distinctive, triangular cross sections. 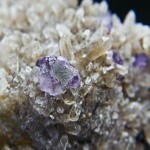 It has a Mohs hardness of 7.0, a vitreous luster, indistinct cleavage, and a specific gravity of 3.2. Its diagnostic jet-black color is caused by its high iron content. 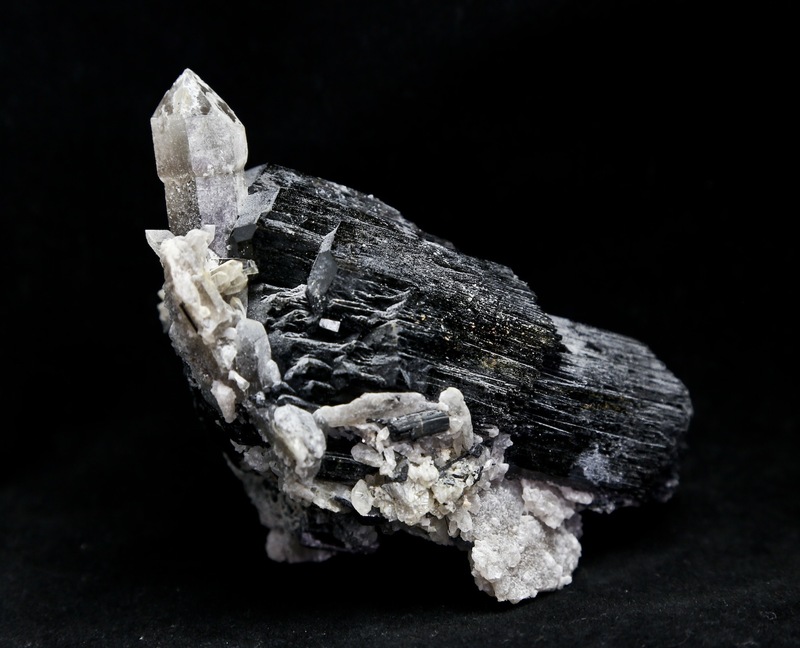 Schorl, the most abundant member of the tourmaline-mineral group, occurs primarily in granite pegmatites with quartz, albite, and the tourmaline-group mineral elbaite. METAPHYSICAL PROPERTIES, LORE, USES: Schorl is a semiprecious gemstone that was especially popular during the Victorian era in mourning jewelry. It serves as a minor gemstone today. Schorl has no technological uses. 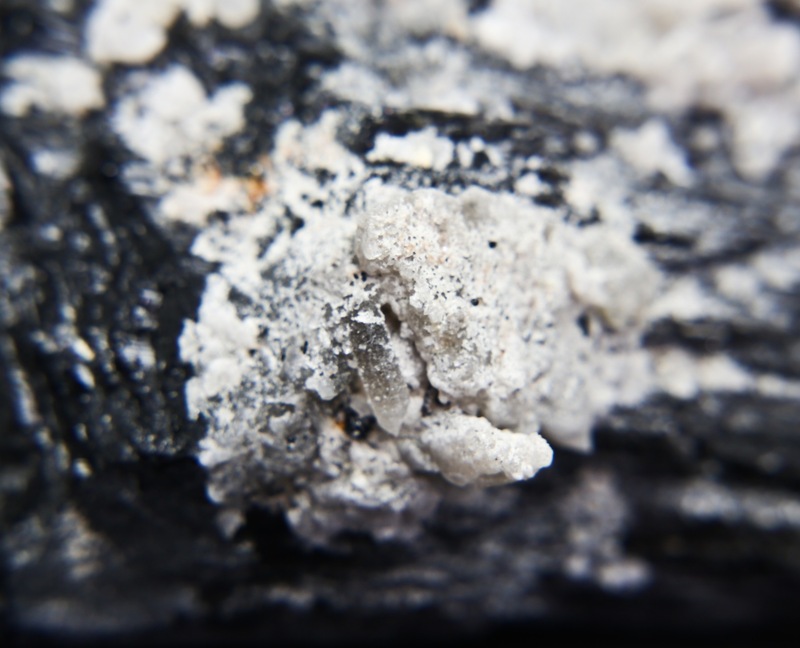 During medieval times, schorl was thought to alleviate the symptoms of pulmonary ailments. Metaphysical practitioners believe that schorl removes and blocks and negative energies, increases physical vitality, and enhances insight and vision in daily activities. COLLECTORS’ INFORMATION: Schorl is widely collected for its jet-black color, vitreous luster, excellent crystal development, and long, striated prisms. 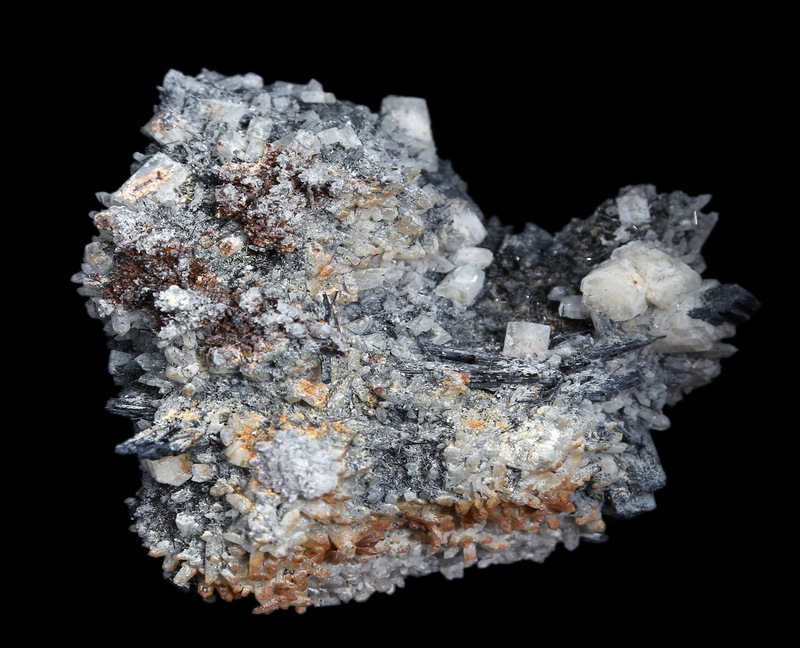 It is especially popular as composite specimens in association with white albite and other pegmatite minerals. HISTORY, NAME, LOCALITIES: Rock crystal, which is common and occurs worldwide, has been collected since prehistory. Notable collecting localities are found in India, Brazil, Germany, Peru, Bolivia, Namibia, Russia, and the United States (Arkansas, Colorado, Maine, Connecticut, Virginia). MINERALOGY, PROPERTIES, OCCURRENCE: Rock crystal is the transparent, colorless variety of macrocrystalline quartz [silicon dioxide, SiO2). The word “quartz” is believed to have originated with the Slavic kwardy, meaning “hard,” in allusion to its substantial hardness. It crystallizes in the hexagonal system and occurs mainly in hydrothermal veins, granite pegmatites, and as geode linings as short-to-long, horizontally striated, hexagonal, prismatic crystals with pyramidal terminations and distinctive, water-clear transparency. It has a Mohs hardness of 7.0, a conchoidal fracture, vitreous luster, and specific gravity of 2.65. METAPHYSICAL PROPERTIES, LORE, USES: Rock crystal has since antiquity been one of the most widely collected of all minerals. It has served as a gemstone and ornamental stone in many cultures. 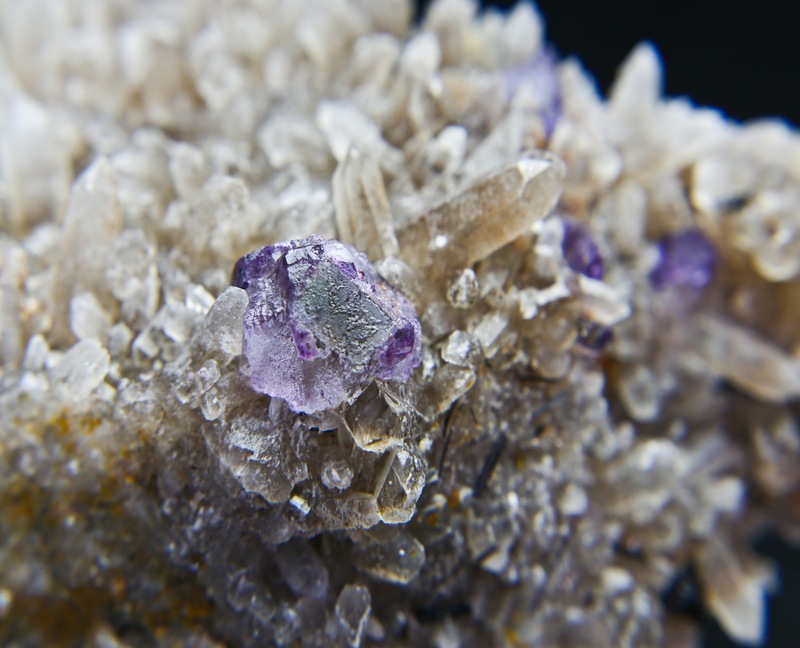 Until quartz was synthesized in the 1960s, rock crystal was vital to electronic frequency controls, filters, and timing devices. 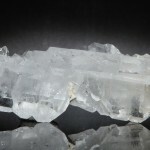 Modern metaphysical practitioners call rock crystal the “universal crystal” because of its numerous abilities to sharpen insight, enhance spiritual development, improve concentration, refine focus, and energize the mind. COLLECTORS’ INFORMATION: Rock crystal is widely collected for its brilliant transparency, superb hexagonal crystal development, and frequent occurrence on large plates and in geodes to make interesting display pieces. 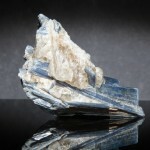 Kyanite, Blue in Quartz 5" x 1" x 1/2"